(Dan Trimmer, 1996). (Cameroons X Tet Peacock Maiden) Evergreen, 7 1/2" flowers, 36" scapes early midseason, rebloomer. 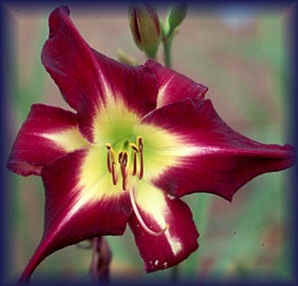 This long petaled intense dark purple flower is an excellent melding of its two parents. Size, striking petal midline, and garden statement from T. Peacock Maiden; and saturated color, vigor and bud count from Cameroons. bud count is about 20 in my Long Island garden but up to twice that in Florida. CAMEROON NIGHT reblooms in each location. In my beginners tetraploid long petaled and spider program CAMEROON NIGHT is very important due to its fine pod fertility. 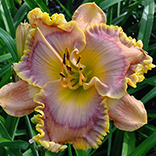 The strong scapes are erect and display the large flowers well above most of the daylily garden. This excellent increaser did show some unprotected winter wear and might like some winter mulch.